St Albans and Peterborough were both great once I’d got there – turns out that even with a satnav, I can’t navigate and drive at the same time. I’m grateful to everybody who kindly turned up and listened to me waffling on, and to the nice people who did all the organising. Special thanks to the staff from the Verulamium Museum who brought a box of delights for us all to play with at St Albans library. I’d never seen a Roman makeup grinder before, and apologies to you, dearest reader, because you can’t really see it either in this photo. 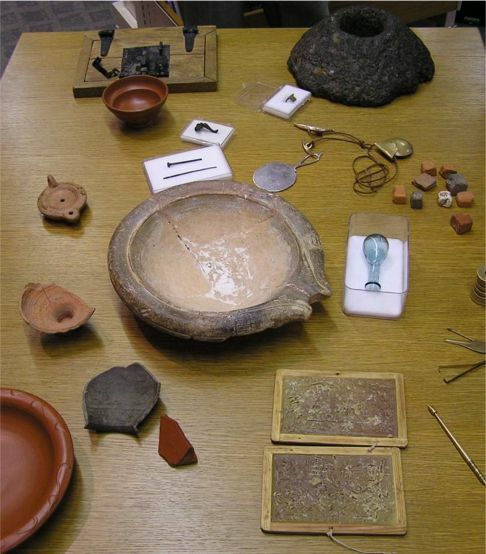 It’s at the top right – the two little boat-shaped pieces of bronze between the silver mirror and the quern stone (round stone with the hole, used for grinding corn). Imagine having to grind your makeup before putting it on in the mornings. No wonder they needed slaves. The little bottle, incidentally, is for holding the tears of mourners and would be placed in a grave. I need to find out when they were used because it’s so lovely that it really ought to go in a novel somewhere. Are these the real monty or replicas? Either way, what a splendid idea. Half and half – roughly speaking the shiny things are replica and the grungy-looking ones are the real thing. The Museum people were great: really enthusiastic and interesting. I have some borrowed bits of Roman pot that I take with me but it was a joy to have so much varied stuff to play with.